26 February 2013 - Barcelona, Spain and Vancouver, Canada - fSONA Networks, manufacturer of the highest-quality, highest-performance, free space optical wireless communications equipment on the market today and Touch, formerly MTC Touch (Mobile Interim Company 2 - MIC2/MIC 2), today announced a partnership to utilize SONAbeam 1250-M free space optical wireless links to provide mobile backhaul connectivity enabling Touch to deliver 4G LTE (long-term evolution) services to customers in Lebanon. With Phase 1 of the project underway, this newly adopted optical wireless technology is being installed throughout Beirut, Lebanon. 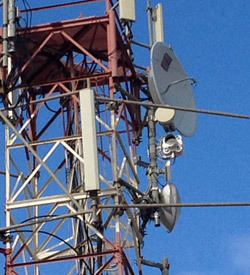 Multiple links will continue to be deployed in the greater Beirut area over the coming year. This partnership will allow Touch to continue to lead the way with innovative, value-added services made possible by 4G LTE connectivity. SONAbeam optical wireless allows Touch to quickly move forward with modernizing the mobile network in Lebanon without the delays associated with trenching optical fiber or negotiating spectrum frequency use for microwave links. Furthermore, SONAbeam transceivers easily integrate with equipment from other mobile supplies due to their standard interfaces and compatibility with existing NMS systems. “As a leading telecom player in the market, we are keen to stay at the forefront of technology. Touch is the first mobile operator to use this new technology in the region. The introduction of fSONA to touch network will help in providing high bandwidth especially for the sites that are facing microwave spectrum congestion in the Beirut area.” stated Wael Ayoub, COO of Touch. fSONA Networks manufactures the highest-quality, highest-performance, free space optical wireless communications equipment on the market today. Key to SONAbeam’s breakthrough laser technology is its operational wavelength of 1550 nm, which provides a broad spectrum of safety and performance advantages. The SONAbeam’s high-powered laser transmitters are able to penetrate heavy rain, snow and fog far more effectively and consistently than any other available FSO technology. On June 1, 2004, Zain (formerly known as MTC Group) the leading telecommunications mobile operator in the Middle East and Africa, was tendered a 4-year agreement by the Lebanese government to manage one of the country's two existing mobile networks (Mobile Interim Company 2 - MIC2). In November 2004, the operation was branded as mtc touch, then as touch in June 2012 and remains today the sole subsidiary amongst 6 others not to be owned by Zain Group. In collaboration with the Lebanese Ministry of Telecommunications, touch continues to enhance its network capacity while consistently providing its customers with cutting-edge products and services. It also seeks to improve the quality and variety of its services, without compromising on cost-effective pricing modules. fSONA Networks is an innovative provider of next generation optical wireless (also known as Free Space Optics, or FSO) solutions that utilise a flexible point-to-point architecture and protocol transparent design. Founded in 1997 with a goal to develop premier, low-cost, eye-safe, optical transmission products for the broadband access market, fSONA has created the toughest, most powerful free space optics systems ever brought to market - the SONAbeam® family. fSONA and SONAbeam are registered trademarks of fSONA Networks. All other trademarks may be properties of their respective companies.